In the ten years since the inception of the Sloan Consortium, the field of online learning has entered the mainstream of higher education, making online learning a core ingredient of tomorrow’s educational paradigms. Now that digital natives are coming of age, the blending of on-ground and online education is continuous and unstoppable. Growing demands for wide choice suggest that the blended agenda presses us rapidly into new realms of inquiry. Thus, the title of this collection, the fifth volume in the Sloan-C series on quality, is Elements of Quality Online Education: Into the Mainstream. The 14 peer-reviewed studies in this volume provide guidance for effectively responding to the challenges facing higher education. Overview: In the ten years since the inception of the Sloan Consortium, the field of online learning has entered the mainstream of higher education, making online learning a core ingredient of tomorrow’s educational paradigms. Now that digital natives are coming of age, the blending of on-ground and online education is continuous and unstoppable. Growing demands for wide choice suggest that the blended agenda presses us rapidly into new realms of inquiry. 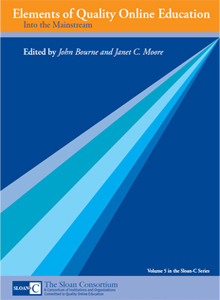 Thus, the title of this collection, the fifth volume in the Sloan-C series on quality, is Elements of Quality Online Education: Into the Mainstream. The 14 peer-reviewed studies in this volume provide guidance for effectively responding to the challenges facing higher education. The studies on Student Satisfaction recognize that significant populations remain underserved. Yet asynchronous learning networks (ALNs) are widening access by easing some of the constraints of place-based, synchronous learning, so that many more and many more new kinds of learners can achieve satisfaction and success. The studies on Learning Effectiveness share an emphasis on the ways that ALN exceeds the “no significant difference” minimum standard for learning outcomes. The studies on blending, combining face-to-face and online methods for learning, offer rich possibilities for what many see as the best of both learning modes. The studies on assessment go to the core of the Sloan-C quality framework and its emphasis on continuous quality improvement through demonstrating progress towards the overarching goal of affordable access for all in a wide range of disciplines. In our time of “profound, rapid, and discontinuous change,” these studies envision solutions to the challenges of online, blended and face-to-face education in higher education.